Audio Training Program: The Leader's Journey - Discovering Your Leadership Impact from Ready2Go Marketing Solutions, Inc.
Great leadership skills can be learned. Throughout this leadership audio series, you will share exactly how your clients and prospects can hone their natural abilities and shape them into effective leadership skills. Through the course of this program the information you provide will dramatically affect your listeners’ abilities as a leader. They will learn about themselves, about the act of leadership, and about how to influence others. Each lesson builds on the one before, and throughout each of the lessons your listeners will identify how their inherent qualities as a person define their impact as a leader. the core values that they bring to leadership. leadership mastery, and the positive leadership qualities that will get them there. behind the shadows of the behaviors that lead to leadership failures. leadership role models for inspiration and ideas that will make them a model leader in their own life. 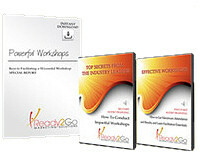 Audio Training programs are a powerful tool for delivering value, and keeping in touch with your clients and prospects. Profile of a Leader is a six-part audio series designed to help your clients and prospects understand and hone their natural leadership abilities to become a more impactful and effective leader in every area of their life.